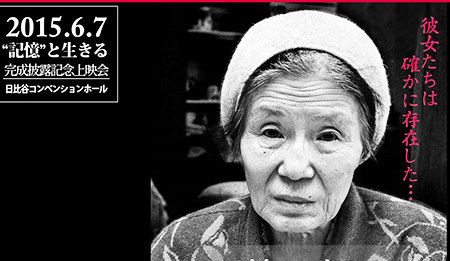 Japanese journalist Toshikuni Doi plans to release a film on Korean sexual slaves during World War II in Tokyo Sunday. The documentary “Live With the Memory” will contain Doi’s reporting in the 1990s in Seoul on seven victims of Japan’s wartime sexual slavery. Its release comes more than 20 years after the journalist began covering the issue in 1994. In a recent interview with the Asahi Shimbun, Doi said that he decided to belatedly pursue the film’s release in Japan to spread the personal stories of the victims. The film runs for three hours and 35 minutes and will be shown at the Hibiya Conventional Hall. He observed and filmed the lives of seven victims in Seoul from December 1994 through January 1997. One of the victims is the late Kang Deok-gyeong from Jinju, South Gyeongsang Province, who worked at a factory in Toyama and was later forced into a domestic military brothel. On her way back home after Korea’s liberation from Japan in 1945, she found out that she was pregnant. The child was born but later died at a child care facility. Doi filmed the last years of Kang’s life until she died in 1997. Six other victims he filmed had all died by 2013. The film is being released at a time of mounting tension between the two countries on comfort women. Recently, Japanese Prime Minister Shinzo Abe angered many Koreans when he called the women “victims of human trafficking” in a Washington Post interview ahead of his U.S. trip in April. The issue continues to hamper bilateral relations as Japan has denied Korea’s call for proper apology and compensation for the victims. Ahead of a landmark diplomatic occasion for bilateral ties this month, some Japanese media reports are urging the two countries to mend their ties through a summit. The two countries will mark the 50th anniversary of normalizing relations on June 22. A Korea-Japan summit has yet to take place since President Park Geun-hye assumed office in 2013. Next Next post: Comfort women victim passed away..
Reblogged this on Lucy Sheen actor writer filmmaker adoptee.